The independent National Electoral Commission has put the percentage of Permanent Voter Cards collected at 78.93 per cent. This was contained in the report released by the commission in Abuja on Friday. The figure was based on the report got by the commission from the field as of Friday. While it put the number of registered voters at 68,833,476, it added that it had also delivered 67,206, 600 PVCs across the country. However, the commission said that only 54,327,747 PVCs, which represent 78.93 per cent of the cards, had been collected. Jigawa, Gombe and Akwa Ibom States top the list of states with highest PVCs collection. While Jigawa State, which is from the North-West has a total of 1,831,276 registered voters, 1,794,646 of them had picked up their PVCs. This figure represents 98 per cent of PVCs collected in the state. Gombe State with 1,120,023 registered voters, has recorded the collection of 1,064,577 PVCs which amounts to 95 per cent of the total PVCs for the state. Akwa Ibom State came third with 94.46 per cent PVC collection out of its 1,680,759 registered voters. This means that 1,587,566 voters had picked their PVCs. Leading from the rear is Ogun State where only 808,590 out of the 1,829,534 registered voters had collected their PVCs. This figure represents a mere 44.20 per cent. However, the figure released by the commission indicated that 1,387,401 PVCs had been delivered to the state. In the Federal Capital Territory, only 62 per cent of the 881,472 registered voters had collected their own PVCs. Lagos State with 5,822,207 registered voters had recorded 63.44 per cent PVC collection. This shows that 3,693,355 of the cards had been collected by their owners. 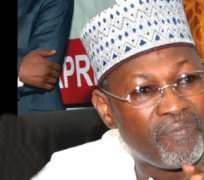 But the commission said that 5,558,062 cards had been delivered for voters in the state. Meanwhile, the commission had also explained the use of Card Readers for the elections. It said that for the first time in Nigeria's electoral history, electronic voter authentication system, with the aid of smart card readers, is being deployed for the 2015 general elections. In an explanatory note, the commission said that Card Readers had enormous advantages, which it said include: 'Once configured, the Card Reader can only read PVCs issued by INEC,' adding that any person that showed up at the polling unit without a PVC or with a card not issued by INEC would not be able to vote. The commission added that the 'Card Reader reads the embedded chip on the PVC, not the barcode, and it shares a secret code with the PVC; thus it is impossible to falsify the cards. 'The Card Reader authenticates the identity of the voter by cross-matching his/her fingerprints with that stored on the embedded chip. No person can vote using another person's PVC.